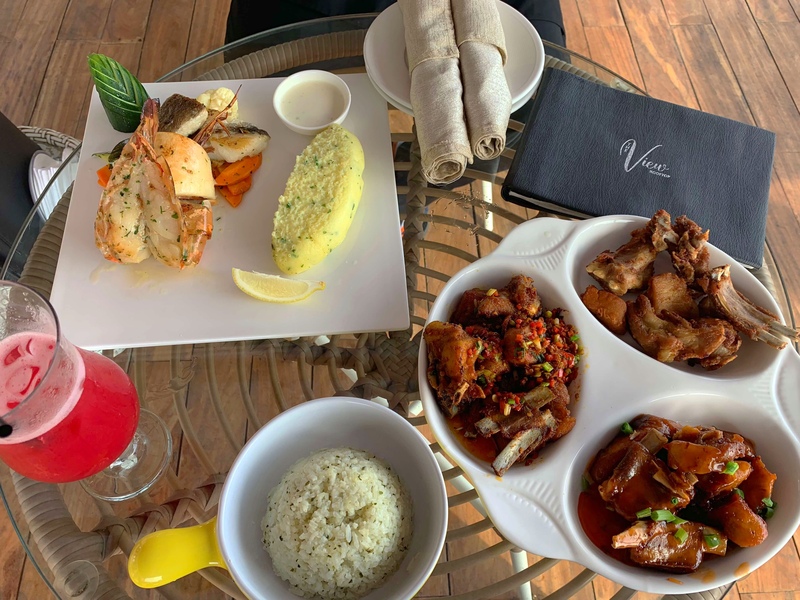 Just when I thought I had experienced it all in the Lagos restaurants ocean view department, the rooftop lounge at Twinwaters Lagos has decided to amaze me! The view of the Atlantic Ocean from this place is simply breathtaking……. After soaking in the beauty of the space, it was time for food business. I started off with tea because I had a cold….. I picked the orange & spice…… The size of the teapot and quantity of milk and honey impressed me…..if you have ever been served tea by stingy restaurants, you would understand. All three styles of the ribs were delightful…..spicy, sweet & sour sticky and fried. What’s not to love about well cooked meat? I love that the rice wasn’t the usual jollof/fried but herbed, it had this subtle but delicious flavor that completed the ribs really well. The fisherman platter! I’m a total freak for seafood and this won my heart. Let me start with the mash, all creamy and smooth with hints of herbs, my mouth is watering at the thought as I write this. Then the main badness…..first off, I love how it was arranged into a mini mountain (presentation is everything for me). Butterflied prawn, croaker & calamari seasoned, buttered up and grilled to perfection paired with a tiny bowl of yummy sauce that brought in an extra layer of butteriness with a lemony kick. Finally, the brightly colored vegetables….. they had the right dose of freshness that just made the meal a complete winner. My dining partner ordered the Long Island, it must have been good because he had two of it! I had the Peach Me cocktail……if you like sweet drinks, this is for you. The vodka content was not enough for me though so I simply asked for a shot….. Menu In all, it was a beautiful experience. I would definitely go back although they say, it is going to be a “members only” clubhouse pretty soon. Address: Twinwaters Entertainment Centre, Okunde Bluewater Scheme, off Remi Oluwude Street, Lekki Phase 1, Lagos. Amazing! The food looks spectacular and the views are unreal!